Hello! It's Wednesday and that means it's time for a new sketch from Freshly Made Sketches! Today Cindy Hall brings us a great sketch that I can use for a couple of ideas that I've had for a Halloween card. Yes, another Halloween card - sorry I can't help it! I love Halloween! Aren't those little owls cute? And my big owl with the googly eyes? What I really like about this card is that I combined products from 5 different companies and it all came together so nicely. And super fun to make! Be sure to stop by Freshly Made Sketches and check out all the wonderful creations from the Clean Team! And please come and play. I'd love to see your take on this week's sketch! Fun Halloween card! I love your choice of colours and the googly eyed owl is adorable. This is so adorable Linda! Owls are so perfect for Halloween! Oh, Linda! This is just too cute! 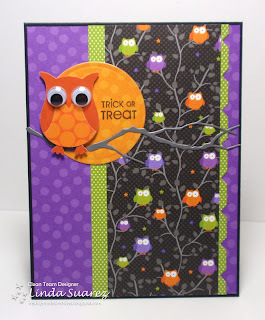 I LOVE this adorable owl paper! It coordinates perfectly with the "googly-eyed owl"! Your card is so cute!! Love all the owls! This little guy is perfect with that DSP! Too cute! How adorable is your bright and unique and colorful Owloween card!! Just adorable Linda .... love the owls and love these colours! Oh so cute Linda!! The owls are great!!! Love the colors too!! So fall!! Linda, this is such a cute card!! Adorable Owl along with the paper. 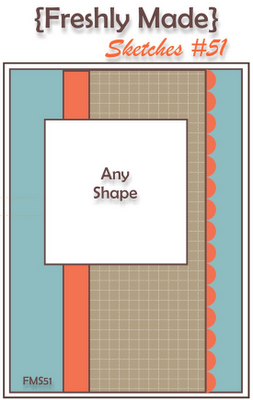 Perfect with the sketch design.